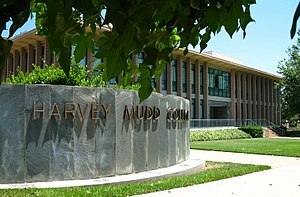 Harvey Mudd College (HMC) is a private residential undergraduate science and engineering college in Claremont, California. It is one of the institutions of the contiguous Claremont Colleges which share adjoining campus grounds. Harvey Mudd College shares university resources such as libraries, dining halls, health services and campus security with the other Claremont Colleges, although each college is independently managed, with their own faculty, board of trustees, endowment, and admissions procedures. Students at Harvey Mudd College may take classes (acceptable for academic credit at Harvey Mudd College) at the other four undergraduate Claremont colleges. The Bachelor of Science diploma received at graduation is issued by Harvey Mudd College. The college is named after Harvey Seeley Mudd, one of the initial investors in the Cyprus Mines Corporation. Although involved in planning of the new institution, Mudd died before it opened. The college was funded by Mudd's friends and family, and named in his honor. Harvey Mudd College entrance on Dartmouth Ave.
HMC offers four-year degrees in chemistry, mathematics, physics, computer science, biology, and engineering, interdisciplinary degrees in mathematical biology, and joint majors in computer science and mathematics; or in biology and chemistry. Students may also elect an Individual Program of Study (IPS) or an off-campus major offered by any of the other Claremont Colleges, provided one also completes a minor in one of the technical fields that Harvey Mudd offers as a major. For the class of 2021, the college received 4,078 applications and admitted 529 applicants (a 13.0% acceptance rate). Of the 225 freshmen who enrolled, the middle 50% of SAT scores were 750–800 in mathematics and 720–770 in critical reading, while the ACT Composite range was 33–35. Harvey Mudd, along with Wake Forest University, long held out as the last four-year colleges or universities in the U.S. to accept only SAT and not ACT test scores for admission. In August 2007, at the beginning of the application process for the class of 2012, HMC began accepting ACT results, a year after Wake Forest abandoned its former SAT-only policy. In 2016, Harvey Mudd was for the second year in a row the most expensive college in the United States, with the total annual cost of attendance (tuition, fees, and room and board) being $69,717. About 70% of freshmen receive financial aid. View of central campus, looking out of the former Norman F. Sprague Memorial Library. Until the addition of the Linde and Sontag dorms, Atwood and Case dorms were occasionally referred to as New Dorm and New Dorm II; Mildred E. Mudd Hall and Marks Hall are almost invariably referred to as East dorm and South dorm. During the construction of Case Dorm some students decided as a prank to move all of the survey stakes exactly six inches in one direction. South Dorm is in the northwest corner of the quad. "East" was the first dorm, but it wasn't until "West" was built west of it that it was actually referred to as "East". Then "North" was built, directly north of "East". When the fourth dorm (Marks) was built, there was one corner of the quad available (the northwest) and one directional name, "South", remaining. To this day "South" dorm is the northernmost HMC dorm. The fifth, sixth, seventh, eighth, and ninth dorms built are Atwood, Case, Linde, Sontag, and Drinkward, respectively. They were initially referred to as "the colonies" by some students, a reference to the fact that they were newer and at the farthest end of the campus; these dorms are now more commonly referred to as "the outer dorms." The college had initially purchased an apartment building adjacent to the newer dorms to house additional students, but it was demolished to make room for Sontag. Since any HMC student, regardless of class year, can live in any of the dormitories, several of the dorms have accumulated long-standing traditions and so-called 'personalities'. A student-led organization, "Increasing Harvey Mudd's Traditional Practices" (IHTP), works to revive college traditions that have slowly faded over the years, and also starts new traditions that the group hopes to see take root on campus. It hosts annual events such as the 5-Class Competition, Friday Nooners, Wednesday Nighters, Frosh/Soph Games, and the Thomas-Garrett Affair. Athletes from Harvey Mudd compete alongside athletes from Claremont McKenna College and Scripps College as the Claremont-Mudd-Scripps Stags and Athenas. The teams participate in NCAA Division III in the Southern California Intercollegiate Athletic Conference. The mascot for the men's teams is Stanley the Stag, and the women's teams are the Athenas. Their colors are cardinal and gold. According to the Division III Fall Learfield Director's Cup Standings for the 2016-2017 year, CMS ranks 12th among all Division III programs, and first among SCIAC colleges. The other sports combination of the Claremont Colleges, and CMS' primary rival, is the team made up of Pomona College and Pitzer College known as the Pomona-Pitzer Sagehens (P-P). The original buildings of campus, designed by Edward Durell Stone and completed in 1955, features "knobbly concrete squares that students of Harvey Mudd affectionately call “warts” and use as hooks for skateboards." The school's unofficial mascot "Wally Wart" is an anthropomorphic concrete wart. In 2013, Travel and Leisure named the college as one of "America's ugliest college campuses" and noted that while Stone regarded his design as a "Modernist masterpiece" the result was "layering drab, slab-sided buildings with Beaux-Arts decoration." The California Institute of Technology, another school known for its strength in the natural sciences and engineering, is located 26 miles (42 km) away (nearly the distance of a marathon) from Harvey Mudd College. From time to time, Mudders have been known to amuse themselves by pranking Caltech. For example, in 1986, students from Mudd stole a memorial cannon from Fleming House at Caltech (originally from the National Guard) by dressing as maintenance people and carting it off on a flatbed truck for "cleaning". Harvey Mudd eventually returned the cannon after Caltech threatened to take legal action. In 2006, MIT replicated the prank and moved the same cannon to their campus in Cambridge, Massachusetts. Money magazine ranked Harvey Mudd 79th in the country out of the nearly 1500 schools for its 2016 Best Colleges ranking. The Daily Beast ranked Harvey Mudd 78th in the country out of nearly 2000 schools for its 2013 Best Colleges ranking. In U.S. News & World Report's 2017 America's Best Colleges, Harvey Mudd College is tied for the 12th best U.S. liberal arts college, and is 1st among undergraduate engineering schools in the U.S. whose highest degree is a Master's. Forbes in 2017 rated it No. 18 in its "America's Top Colleges" ranking, which includes 660 military academies, national universities and liberal arts colleges. As of 2007, the median GPA of Harvey Mudd students was 3.35, behind other peer institutions; only seven students have achieved a perfect 4.0 GPA. In 1997, Harvey Mudd College became the sole American undergraduate-only institution to win 1st place in the ACM International Collegiate Programming Contest. As of 2017, no American school has won the world competition since. In 2006, the Harvey Mudd College mathematics department received the American Mathematical Society award for an Exemplary Program or Achievement in a Mathematics Department. Two of the department's alumni, Joshua Greene and Aaron Archer, were winners and honorable mention for its undergraduate Morgan Prize in 2002 and 1998 respectively. Notable Harvey Mudd College alumni include co-inventor of SQL Donald D. Chamberlin (1966), astronauts George "Pinky" Nelson (1972) and Stan Love (1987), and diplomat Richard H. Jones (1972). ^ As of June 30, 2017. "2016–2017 Financial Statement". Harvey Mudd College. Retrieved 13 January 2018. ^ "Harvey Mudd College 2016 990 Form" (PDF). Guidestar. Retrieved 25 September 2018. ^ National Center for Education Statistics. "IPEDS Data Center". Retrieved 30 April 2012. ^ "History of Harvey Mudd College". Harvey Mudd College. Retrieved 2015-04-24. ^ "Street view of N. Dartmouth Ave". Google Maps. Retrieved 30 January 2015. ^ "Harvey Mudd College Catalogue". Harvey Mudd College. Retrieved 2015-04-24. ^ Mangan, Katherine (August 28, 2018). "How a Liberal-Arts College Is Rethinking Its 'Soul Crushing' Core Curriculum". Chronicl of Higher Education. Retrieved October 3, 2018. ^ "Harvey Mudd College Common Data Set 2017-2018" (PDF). Harvey Mudd College. ^ a b Marklein, Mary Beth (2007-03-19). "All four-year U.S. colleges now accept ACT test". USA TODAY. Retrieved 2007-03-18. ^ "Harvey Mudd College Begins Accepting ACT Scores for Admission". Harvey Mudd College. January 25, 2007. Archived from the original on October 11, 2007. ^ Katie Lobosco, The 10 most expensive colleges this year, CNN Money (November 11, 2016). ^ "Campus map". Harvey Mudd College. ^ "New Harvey Mudd Residence Hall Named for Alumnus, Board Chair". Harvey Mudd College News Archive. July 14, 2015. Retrieved 2015-11-15. ^ Stephanie L. Graham (Winter 2005). "A Treasured Friendship". Harvey Mudd College Bulletin. Archived from the original on 2006-09-03. Retrieved 2006-12-13. ^ "Mysteries of Mudd". Harvey Mudd College Bulletin. Winter 2005. Archived from the original on 2006-09-03. Retrieved 2006-12-13. ^ Nisha Gottfredson (March 2004). "Thy Name is Mudd: The hidden Mudder mythos – it's more than you think". Claremont Student. Archived from the original on March 1, 2005. Retrieved 2006-12-13. ^ "CMS Quick Facts". Claremont Mudd Scripps. Retrieved May 30, 2017. ^ "2016-17 Learfield Sports Directors' Cup" (PDF). NCADA. ^ "Pomona Pitzer". www.sagehens.com. Retrieved May 30, 2017. ^ "CMS Athletic Facilities". cmsathletics.org. ^ a b c Ivan Spencer (October 2013). "America's Ugliest College Campuses". Travel + Leisure. ^ "Caltech Cannon Heist Memorial Page". ^ "Howe & Ser Moving Co". Retrieved 2006-04-16. ^ "Baccalaureate Origins of S&E Doctorate Recipients". Archived from the original on 2014-10-11. ^ "Money's Best Colleges". Money. 2016. Retrieved 2017-05-11. ^ "The Daily Beast's Guide to the Best Colleges 2013". The Daily Beast. October 16, 2013. Retrieved 2014-09-26. ^ "Best Undergraduate Engineering Programs Rankings". U.S. News & World Report. Retrieved 2016-09-14. ^ "Harvey Mudd College Profile and Judging Performance at HMC" (PDF). ^ "1996-97 21st Annual ACM International Collegiate Programming Contest Final Report". 1992-03-02. Archived from the original on 2008-07-05. ^ Forsberg, Birgitta (2005-04-09). "American universities fall way behind in programming: Weakest result for U.S. in 29-year history of international technology competition". San Francisco Chronicle. ^ "Harvey Mudd Mathematics Department Garners AMS Award" (PDF). Notices of the American Mathematical Society. 53 (4). April 2006. ^ "2002 Morgan Prize" (PDF). Notices of the American Mathematical Society. 50 (4). April 2003. ^ "1999 AMS-MAA-SIAM Morgan Prize" (PDF). Notices of the American Mathematical Society. 46 (4). April 1999. Wikimedia Commons has media related to Harvey Mudd College.